SFTraxx.com - The Best Free Soundcloud Promotion. Ever. 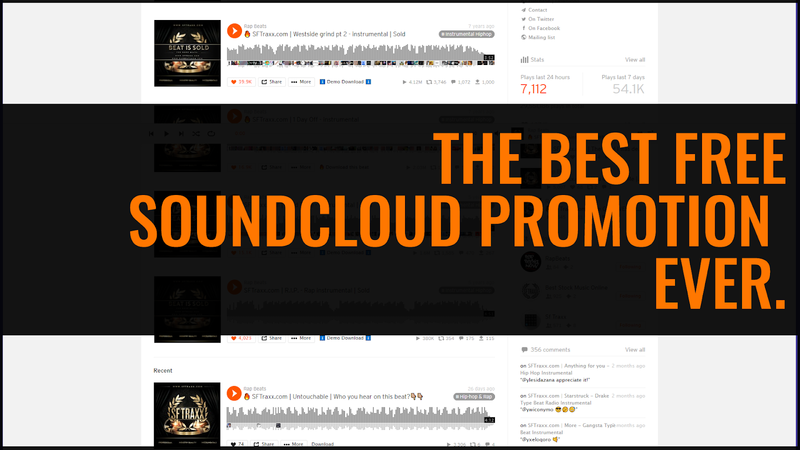 The Best Free Soundcloud Promotion. Ever. Looking to get those numbers up the right way? No worries, I've got the recipe.. Anyone who's on Soundcloud is looking to get some form of Soundcloud Promotion. Also, equally matched are the number of services offering to take your money in exchange for that Soundcloud promotion. They could be - if you want to see more plays on your profile. The truth is that most of these promotional services are just using automated "play boosting bots" that bump your numbers up and that's about it. As a matter of fact, the other day I was talking with an artist who told me that someone "hooked him up" with a Soundcloud Promotion. So I went to his profile page to check out his numbers and yes, they were up [quite a bit] but his tracks had <---wait for it---> zero engagement. I guess one could argue that people who see higher numbers are more likely to click on your music (which sometimes is true) but since most people nowadays are aware of bots, as soon they see no comments or likes associated with those plays - they are more likely to keep it moving. Now, there are legitimate promotions floating around but today I want to share a FREE, effective, targeted and timeless promotional method with you that will help you get your numbers up.. This method will help you connect with and build a targeted following of people who are into your style of music so that when you do decide to drop new tracks, you'll get genuine plays, likes, shares and comments from people who are into your "style" of music - without having to ask or pay for them. Your numbers are probably not gonna skyrocket overnight. However, If you follow this method you will build a targeted audience that will grow over time, and that, my friends, is worth its weight in gold..
Soundcloud Promotion - The right way! >To begin, let's use the search bar to locate an artist or group who's sound style is similar to yours. Once you've located a match, click their username and go to their profile. Next, click on their top song. Now look on the right hand side and do you see where it says "related tracks"? Click the "view all" tab to the right of that. Once the page reloads you'll have a list of similar artists who have been chosen by Soundcloud's algorithm based on interactions on SoundCloud. Take a few minutes to thumb through and listen to the tracks. Seriously. Most people won't put in this work but this probably matters the most. This will help you connect by giving you something to discuss should you choose to engage with the artist or group because "Hey man, I was listening to song xyz and I was really feeling the part when..." sounds way better than "hey! check me out! Here's my link!". Tip: Once you find people who fit your criteria you can quickly check out their "level of seriousness" by hovering your mouse cursor over their username. Do they have the little orange star next to their name? This is a good sign. This tells me that this Artist / Group cares enough about what they are doing to invest into their profile. Do they interact with people who comment on their tracks? After you've determined that they sound (and appear) like someone you might want to connect with, send them a short, genuine message via the Soundcloud messenger with a link to their track (the one you listened to, remember?) and talk to them about it. Back on topic: Tell them what you liked - tell them why you think they should collab, etc and If all goes well you should receive a genuine response from them. 9 times out of 10, if you get a response, this means that they have probably checked out your stuff too and are feeling it as well. You've just effectively promoted yourself and have started a relationship which (if you continue to do this) will ultimately result in a genuine targeted following. Now, its time to be realistic. Will everyone hit you back? Will everyone check you out? But if they don't hit you back, don't sweat it, just keep it moving. You'll eventually connect with the right people and that's the goal, right? Keep track of who you message via your inbox and if you don't hear back from them in a few days drop some feedback as a comment on one of their most recent tracks along with your contact info, etc. - Follow up matters. Once you've found artists that share the sound style you are targeting - see who their followers are. Chances are they are into the same type of music. Reach out to them in the same way. So, if you do it right, you should be on the road to effectively promoting yourself and building up your following the right way. My apologies if this has seemed a bit long winded but I wanted this to be clear and easy to follow. Soundcloud can be a great tool if you know how to use it right. Oh yea, I almost forgot.. Effective Soundcloud Promotion is not spamming your links in messages or track comments or "@" tagging people on tracks. That sh*t is lame and makes you look like an amateur. Please take the time to like, comment and share it.